Last week I hosted a tasting party for the brand new tonic and elixir company Body and Eden. My guests were amongst the first to sample their herbal elixirs and superfood tonics made from seasonal and local greenmarket ingredients. For our party two of the Body and Eden tonics were mixed with Bombay Sapphire East featuring hints of lemongrass and black pepper. If you are going to drink a cocktail I cannot think of a a healthier way to do it! After the party I had the pleasure of sitting down with the lovely founders of Body and Eden, Hillary and Aubrey. They are incredibly effervescent and clearly passionate about health. If you are in the NYC or LA area I highly suggested ordering some of their amazing tonics and elixirs. They are a great remedy for gray winter days! Tell me a little about yourself, your background, and how you met? I started dancing ballet at a very young age, so eating and energy for strenuous exercise was always on my radar. However, I have to say I definitely wasn't an example of health – I lived on all things sugary, and as a total foodie, it's hard for me to say no to delicious things. Living and working in publishing in NYC, I'd tried every kind of vitamin and cleanse out there to try to supplement my diet with nutrients, but cutting out food just wasn’t the answer - I can't impede my lifestyle. Aubrey and I, friends since university, had always compared notes on healthy foods/trends, and her experimentation while living on the west coast really led to producing nutritious tonics as raw, live supplements - filling a niche I know I’d been searching for. I was raised in a very health conscious family. Every week we drove across town to one of the first Whole Foods in the country and at home my mother had me making green juices. As I got older, eating the healthiest option available to me wasn’t enough. My stomach had been torn apart by antibiotics and stress. I started to experience a variety of digestive and hormonal problems and my body had a hard time digesting the simplest of foods. My sister was the first one that sat me down and said I had a choice. At that point, I started changing my diet to more simplistic foods so I could start to identify the problem areas. When I moved to California I sought out a variety of health practitioners, tried several different cleanses and diets and picked the brains of everyone I encountered. Over time I started to learn what worked for me and what didn't. Cleanses helped me clear out the junk so I could feel my body and make healthier choices about what I put back in it, but some of the same problems would show up again until I started making fundamental life changes on an emotional, physical, and mental level- a process that will never end. This can be a scary and rough process. When I created Body and Eden my main goal was to support people while they were going through some of these major shifts, emotionally and nutritionally. I wanted to create a line of balanced drinks that help to promote internal stability, when other things may seem chaotic and out of our control. How did the idea for Body and Eden come about? Body and Eden started out as a nutritional consulting company. I had received so much help and wisdom from the community that I realized it was time to give back. Friends had started to come to me for nutritional and lifestyle advice. I passed on what I had learned, but also really focused on helping them feel inside their body and checking with themselves so they could start making their own decisions and feel more empowered when they saw their practitioners. My years of fascination with the body and personal experience of a variety of symptoms allowed me to sense and see some things they were missing. I would offer my perspective and then encourage them and provide them with tools so they could really determine what was true for them. We are each our own expert. Nobody knows your body better than you. That is why I created this company with the “Customize Your Own Tonic” section, in order to encourage people to determine what they need. This leads to empowerment. The drink line developed when I couldn't find what I was looking for on the market. I personally have had trouble with juicing because my blood sugar drops and juices became ultimately too sweet. I visited a tonic bar in Los Angeles often but noticed that powered greens just didn't react the same in my body and many raw food drinks wound up being really high in fat, oil, or nut butter which was hard on my system. Nothing beats whole fresh foods; fresh veggie concoctions with added algae seemed to stabilize my blood sugar and leave me feeling energized and feeling empowered. I asked myself how I could make these even more nutritious and stabilizing. I met an herbalist who understood my philosophy on health and together we created the infusions that now serve as the base for most of our drinks. The concept and names came from walking around New York. I kept hearing people say, “I don't have time". I wanted to reframe the mindset to recognizing what you do have and how to build off that. We are not broken and to be constantly supplementing from the mentality that " I don't have something", is not sustainable. Our bodies are amazing and extremely adaptable. If we just support them they are capable of some extraordinary things. What makes your tonics and elixirs different from anything else currently available? 1. The herbal infusions. 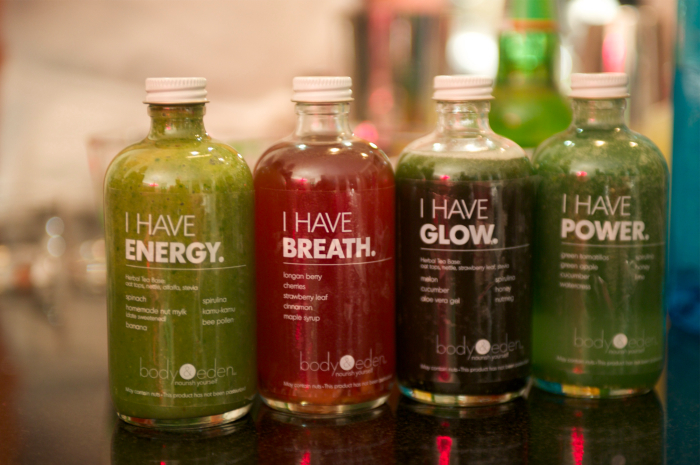 Our drinks are made to support the body and it's functions. It takes very little of the right type of nutrition to fuel our systems. Our drinks and tonics are not juice- we blend whole ingredients and don’t strain them - fiber and nutrients from whole foods are so important! 2. Our herbal tea bases derived from various ancient health recipes and medicinal principles are blended with fresh, local greens and superfood supplements such as spirulina, bee pollen, chlorophyll, etc. Who do you see as your ideal Body and Eden customer? Someone who wants to supplement his or her diet with a raw, live vitamins. Someone who wants to assist their body's natural functions to better retrieve their energy, have healthy skin, strength, and just plain feel good! Bottom line when you are healthier you look better, function better, and things around you will start to reflect that. You are stranded on a desert island. What 5 products or items would you want with you? I don't need much else. Though I was on a recent hike and got lost. I had chlorella tablets, a sketchpad, and markers. I was wishing I had a water filter and a flashlight. I know it's hard to pick favorites but what is your current favorite Body and Eden tonic or elixir? Hmm… Mine is the Energy. The banana and organic dates make it taste so so good!! Mine is Balance…Zucchini is such a great anti- carcinogenic and it has a unique grainy flavor. Anything else you would like to share about Body and Eden? We are offering a new way of looking at health. People have learned how to clean out the harmful things we have been feeding ourselves for years, but how do we support growth, and change? My hope is that everybody who drinks a Body and Eden tonic gets a feeling for our larger philosophy and we all can move closer to sustainable changes in our lives. We are all in this together.